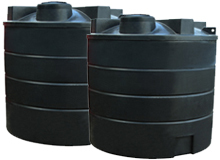 20000 litre water storage tanks suitable for agricultural, commercial and industrial applications such as rainwater harvesting. Made from a seamless one piece mould, our tanks are manufactured from premium polymer in accordance with our ISO9001:2015 certified quality control procedures. 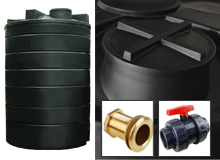 Our drinking (potable) water tanks are made using WRAS Approved polyethylene Icorene 1314 DW Black 9001 or Revolve N-748 Black approved under WRAS Approval 1202543 and 1201523 respectively. The post popular applications for these tanks are general water storage, rainwater harvesting, spraying and rainwater collection. Where possible, we will accommodate any tank modifications to make your installation easier, please call 01763 261781 to discuss any modifications. This tank will be delivered using a large lorry. As the buyer, you should ensure there is safe, adequate access and provide your own off loading facilities. The off loading facilities should be suitable for heavy items; forklifts, cranes or Hiab's are suggestions. If you're in any doubt about off loading, please give us a call and we'll help find the most cost effective solution.